"Dalton Meets Jack" Jack met Premier Dalton McGuinty at the Oakville Chamber of Commerce luncheon. Click here to read the story about it in the North Oakville Today paper. The 4th Jack's Lemonade Stand for SickKids appears on CTV News. 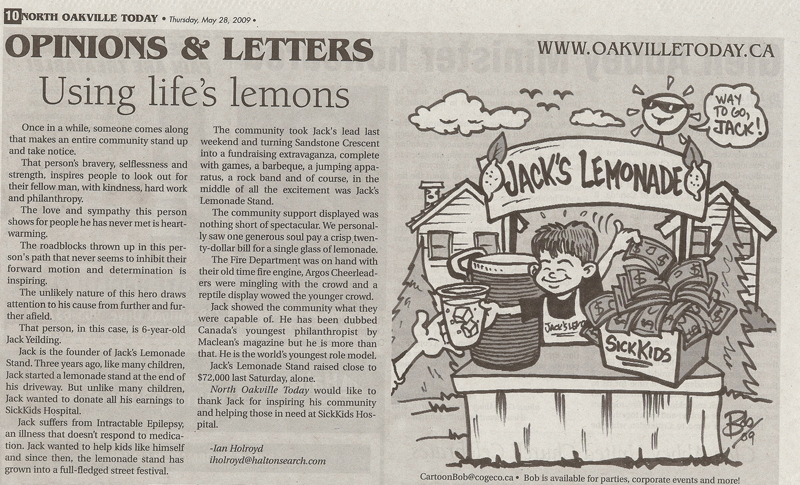 Oakville Beaver helps spread awareness about Jack' journey and his 4th lemonade stand. North Oakville Today promotes Jack's upcoming event. Jack invited to the Ontario Legislature by MPP Kevin Flynn, where Jack received a standing ovation! Jack joins SickKids Researchers and Scientists at the groundbreaking ceremony for the new SickKids Research Tower, scheduled to open in 2013. Jack and his mom, Jodi, share Jack’s story on "EZ Rock 97.3" and "CFRM 1010"
Whole Food’s "One Dime at a Time" program support of Jack’s Lemonade in "Oakville Today"
Maclean's magazine refers to Jack as "Canada's Youngest Philanthropist"
Today's Parent features Jack in its "Hero" section. Jack on Global TV's "Making a Difference" segment with Susan Hay. Jack had a blast filming the segment with Susan Hay and the Global TV crew. Thank you to Jack's friends at the Oakville Fire Department for coming out with a truck that morning. The Premier of Ontario, Dalton McGuinty, sends Jack a letter. SickKids Foundation presents Jack with "Spirit Award" - Hosted by Daniel Cook, Jack receives "Spirit Award" at Kids Believe in SickKids giving gala. Jack's Lemonade Stand was featured on CTV's "My Toronto is ..."